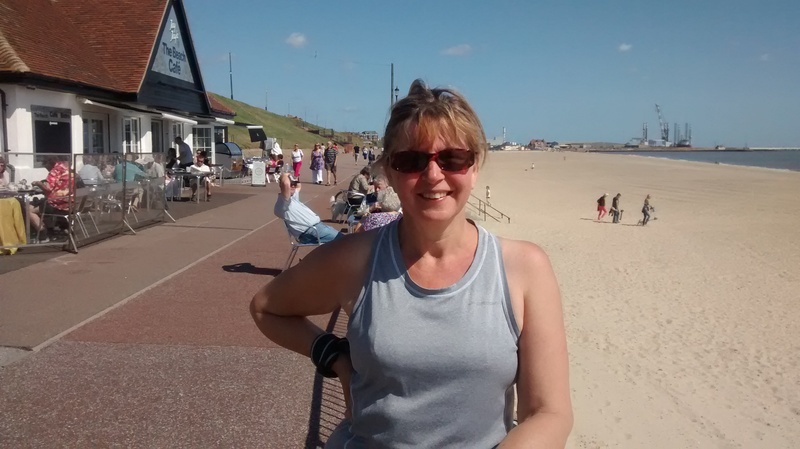 Ms Alive and Running and I ran Gorleston parkrun, near Great Yarmouth, Norfolk recently. It was a fine, warm, sunny day and the course comprised of two simple laps of a lower and upper sea promenade with only one steep zig zag path connecting the two levels ie we only had to ascend it once because we started at the top and finished at the bottom. 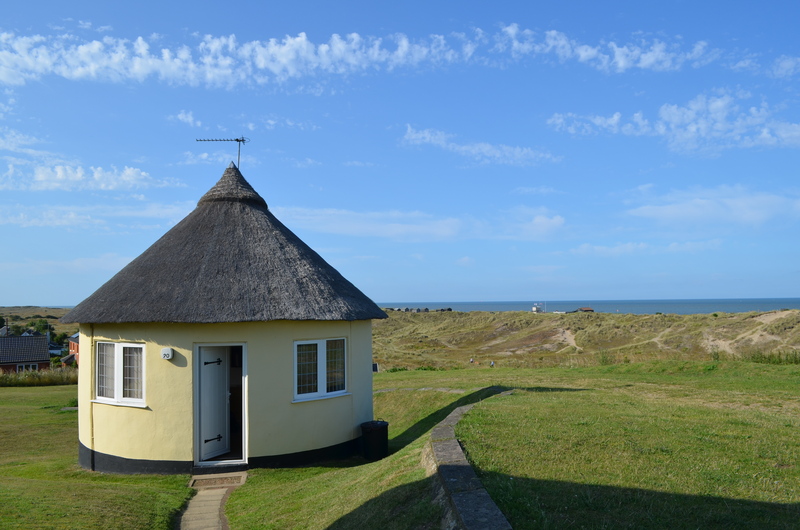 We stayed in this little hobbit house overlooking the sand dunes in Winterton -on-Sea. I went for a lovely run to an adjacent seaside town by way of the dunes. I struggle to make an appropriate comparison but suffice it to say that one was a WI stronghold and the other a magnet for fast food and candy floss lovers. The latter was undeniably colourful in every sense and I found my senses being overwhelmed. Winterton, I suspect, is a Tory and UKIP kind of place but I might have found evidence to the contrary when I fell into conversation with Peter Chapman who was painting images onto his camper van. 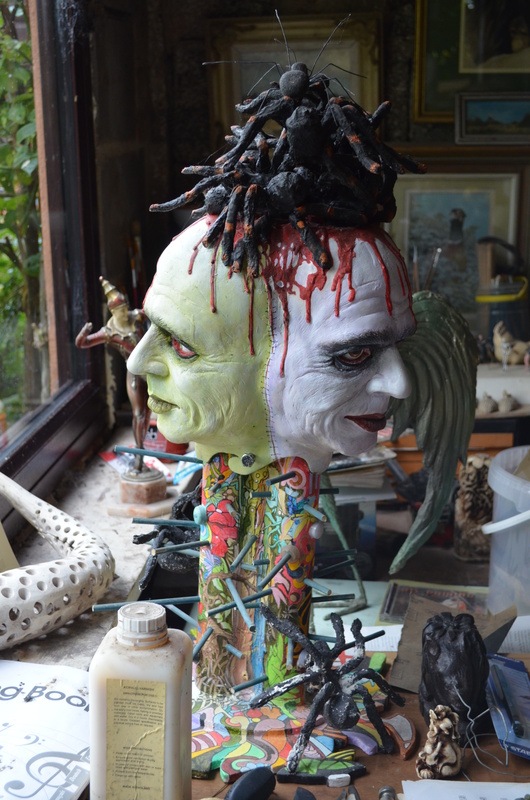 It transpired he is the uncle of the Chapman Brothers, Jake and Dinos, nationally and internationally known visual artists with a controversial portfolio. 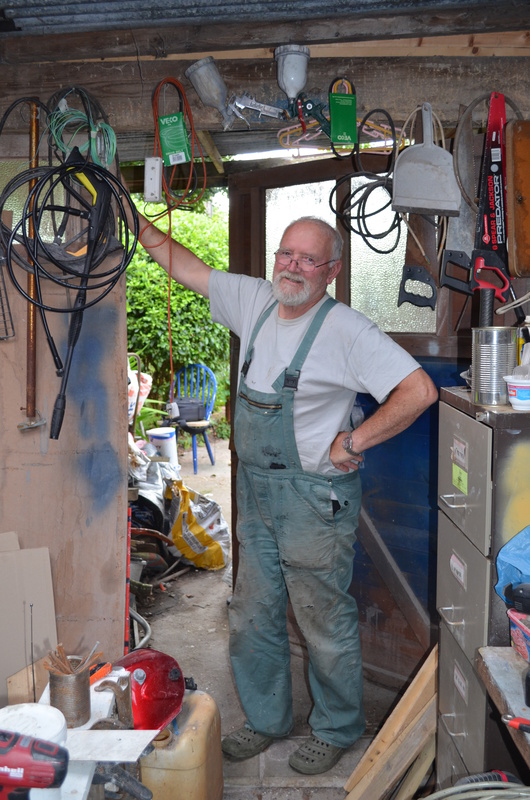 He is also an artist and sculptor and gave me a tour of his studio and garden.This was very generous of him. I can confirm that he is not exactly a typical resident of Winterton. Back to Cambridge. 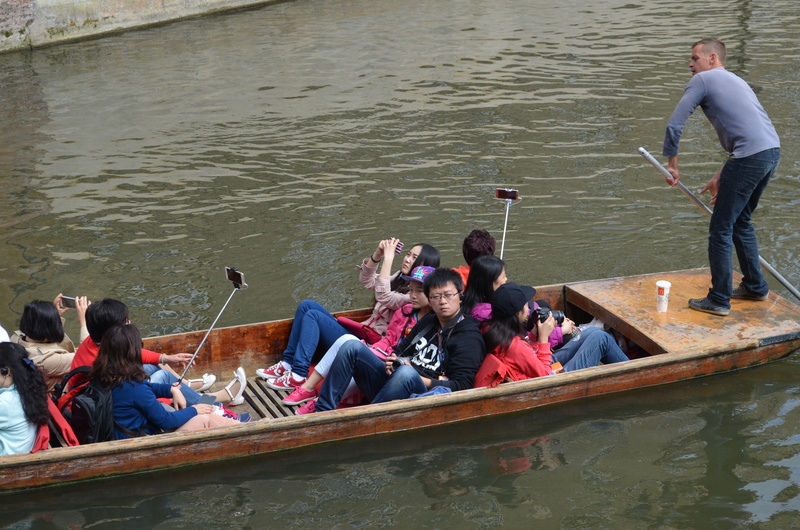 I like to watch and take pics of the punts, particularly from Garret Hostel Bridge or King’s College Bridge. 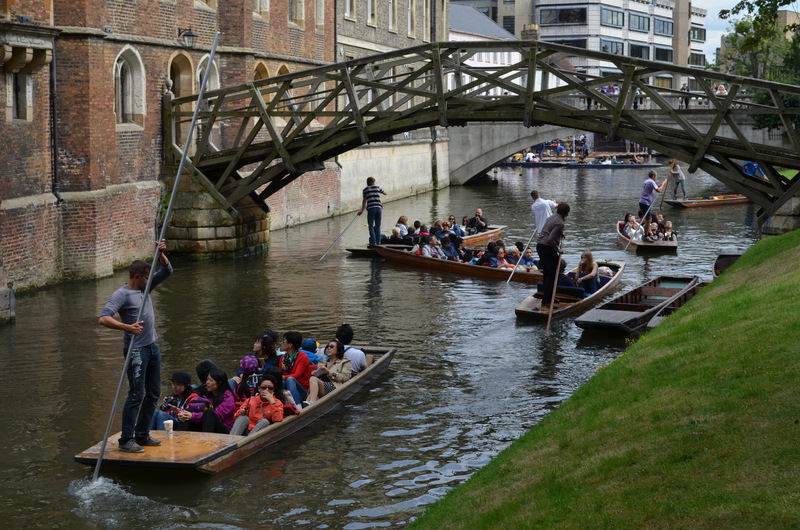 Today I went to Queens’ College and went onto the Mathematical Bridge. 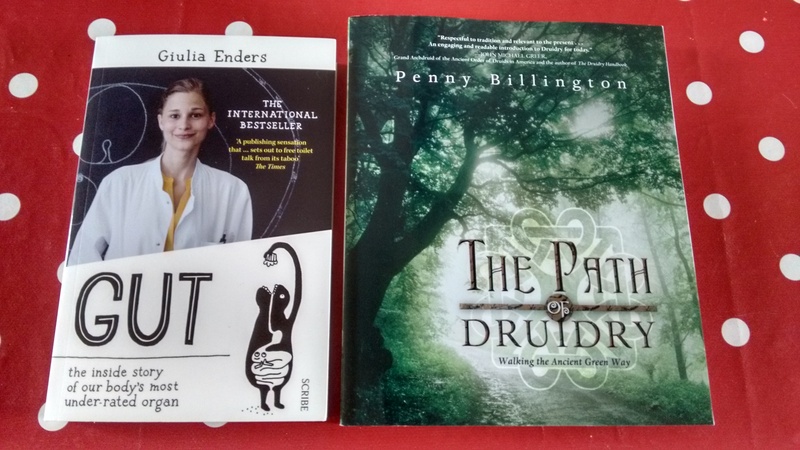 My Druid book finally arrived, by Amazon (non-drone) rather than Guardian bookshop who said it was out of print. Naughty Guardian bookshop! My spiritual and magical renaissance is still on hold because I’m reading Gut : the Inside Story of our Body’s Most Under-Rated Organ. Very readable, very interesting, a complete education in intestinal health, ill health and poo related facts. Warning : sitting on a Western style toilet seat is not good for gut health. Squatting is much better. Lastly, I’ve been doing plenty of digging and planting donated plants. My therapeutic gardening project continues to progress at a glacial pace for various reasons but is set to take a leap forward when I cover the constructed skeleton of the polytunnel with its plastic cover in the next fortnight. 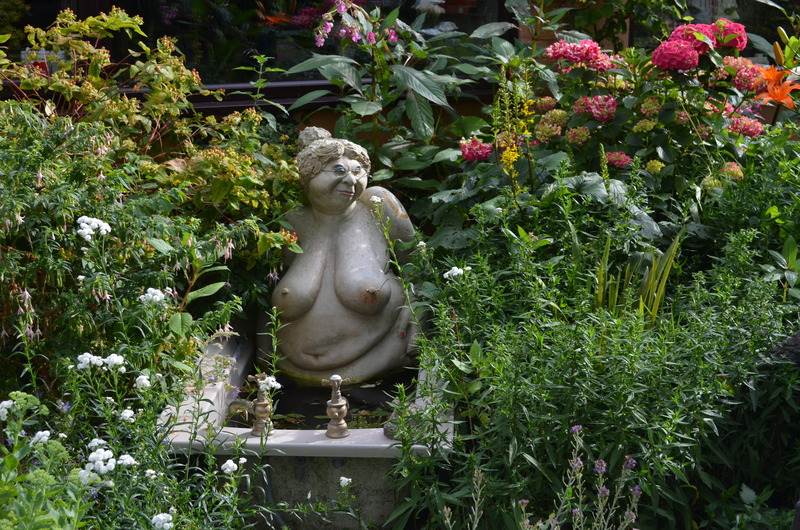 I’ve visited another gardening project, Gardening with Grace, in Bedford and they’ve visited me. It’s been very helpful and given me a different perspective on how to go about what I want to achieve. My supper this evening, I hesitate to call it supper because a chum considered this posh. He felt dinner was the correct term for the hardworking, down to earth working person. Anyway the picture of this meal reveals to the world that I’m not starving and that broccoli continues to be an honourable substitute for Brussels sprouts whose season has passed. Please contrast it with yesterday’s supper/meal below. 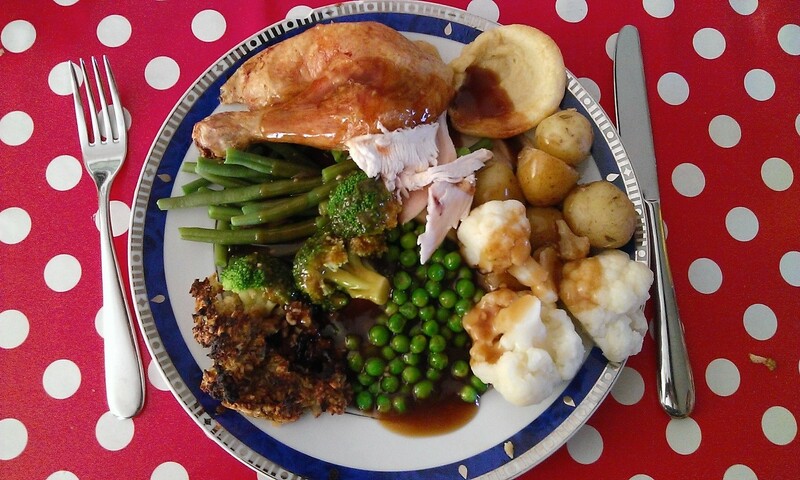 Sharp eyed readers will note that this meal/supper/dinner is on a tray and that, reassuringly, it is consistent with other food pictures posted in that it features broccoli. 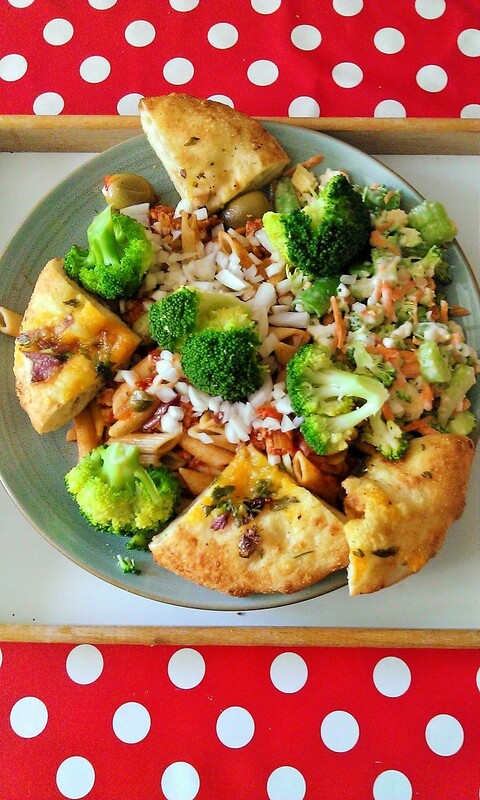 Also present : penne pasta, turkey mince in bolognese sauce, cheese and red onion flatbread, mixed salad, olives and raw onion.This reasonably balanced nutritional intake ensures I am able to run like Hermes, messenger of the gods and son of Zeus and Maia. Today, I went for a 10k run and it was undeniably hot. Nevertheless I felt OK while I was actually moving. It’s when you stop that you feel the heat and later feel a weariness that is different compared with running in the autumn or winter. Tomorrow is a rest day and Saturday is Cambridge parkrun. I need to go for a longer 15k but I’ll probably wait until it’s cooler. I saw some of the women’s triathalon at the Commonwealth Games at Glasgow this morning. Very entertaining and an exciting finish. Unfairly, the BBC news I watched gave more prominence to the Brownlee brothers in the men’s triathalon getting gold and silver rather than Jodie Stimpson and Vicky Holland taking gold and bronze. They showed longer clips from interviews and more of the Brownlees’ race. This is the Winter Gardens in Great Yarmouth, Norfolk, on the East Coast. It opened in 1904, originally to house flora and fauna but over the years has been used as an ice skating rink, concert venue and children’s amusement park. 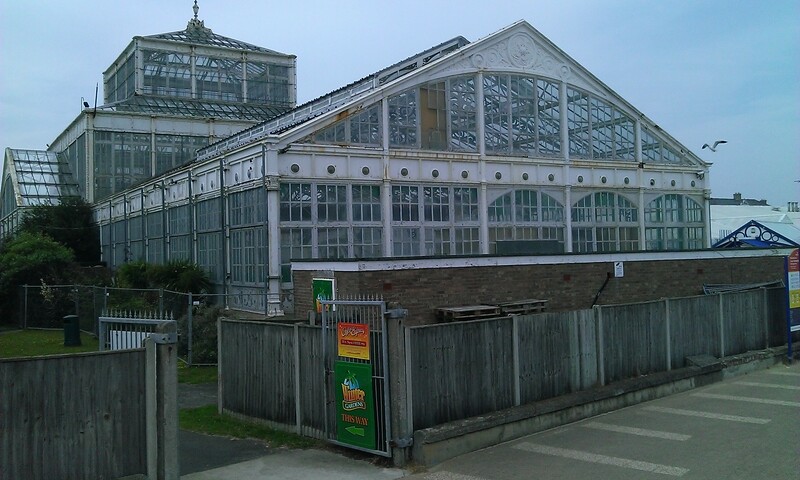 Now in considerable disrepair, it’s awaiting restoration and probable return to its original use of providing a large structure to display plants and showcase bio diversity. Funding has not been agreed so far. It looks very sad and unloved at the moment but still majestic. I’ll have a word with Zeus. He’ll know how to sort this out. Watch out for more pictures of tormented fine old Yarmouth buildings in blogs to come. And lastly, I was instrumental in saving a family of spiders tonight. Ms Alive and running pointed them out, simultaneously giving me a you’ve-failed-to-vacuum-them-away mean look. I, having appreciation of the bigger picture, became aware that a drama was about to unfold. A gnat flew into some dangling webbing and immediately mummy or daddy spider rushed over, swiftly immobilised it by rapidly weaving silken thread around its body, and then toddled back to its little spiderlings. Ms Alive and running was amazed that this was played out in front of us. This was far better than watching East Enders and much more exciting than reading inane comments on Facebook. I announced that the whole family of spiders (and their relatives) were under my protection and were now, officially, my pets. This occasioned another harsh look. I’ll be hiding the vacuum cleaner as a precautionary measure, of course.